The first and anonymous public document that purports to be Rosicrucian is the Fama Fraternitatis Rosae Crucis, a manifesto which appeared in 1614. in Cassel, Germany, as an apendix of the 77th. 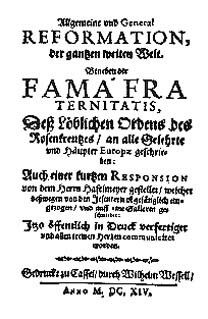 Advertisement ( section ) intitled Generale Riforma dell' Universo ( The Universal Reformation of Mankind ) of a German translation of Bocallini's satira Ragguagli di Parnasso ( Advertisements from Parnassus). The Fama which created a profound effect was soon published in separate form. In 1615 appeared the Confessio Fraternitatis, issued with the Fama . Both manifestoes passed through several editions while Boccalini's essay disappeared. The Chymical Wedding of Christian Rosenkreutz, Anno 1459, issued in 1616, is a later book in the chronology and introduces for the first time the name Christian Rosenkreutz that remained unnamed except for the three initials in the first manifestoes ( Fama & Confessio Fraternitatis ). These works have been attributed , though not without question, to the German Lutheran philosopher and theologian Johan Valentin Andreae, who, it is reported, on the authority of M.C.Hirachen, to have confessed that he, with thirty others in Wurttemberg, had sent forth the Fama Fraternitatis; that under this veil they might discover who were the true lovers of the wisdom, induce them to come dorward. In spite of the most scholar researches postulates Johan Valentin Andreae as the true autor of the first Rosicrucian manifestoes another researches incline us to belive that at least the Fama and Confession was actually written by Lord Verulam , Sir Francis Bacon, well known as the Chanceller of Parnassus, the allegorical Mount of the Poets. Fama Fraternitatis gives an account of the life and adventures of Christian Rosenkreutz, a symbolical character, who is the founder of the Society of Rosicrucians. According to the Legend ,C.R.C. has born in 1378 in a poor , but noble, family. Having lost his parents still boy, he was placed in a convent since five years old. In the cloister he learned Latin and Grecian . At the age of the fifteen year of age , finding the instructions insatisfactory, he associated himself with a a monk , Frater P. , on a pilgrimage for the Holy Land , to visit the Holy Sepulcro.His fellow traveler , Frater P. died on their arrival at the Island of Cyprus , but C.R.C. proceed alone on his journey for Damascus. At Damascus poor health detained him , and he remained studying with astrologers and physicians. Hearing of a groups of wise men abiding in Damcar, a mystical city in Arabia, C.R.C. continued his jorney to Damcar and arrived there with sixteenth years of age. In Damcar he was received by the wise men as anybody long awaited,and remained among them along three years, learning the arabian language and translating along a year the whole book "M" for the Latin. . After he sailed for Egypt, where he continued his studies, and having traveled the Mediterranean, he at lenghth arrived at Fez , holy city of Morocco that was during the Middle Ages one of the most famous Centers of the Alchemic Arts . There he was instructed concerning the creatures existing in the elements. From Fez he crossed over into Spain carrying with him many rare medicines, curious animals, and wonderful books. He conferred with the learned at Madrid, but he met with unfavorable reception. So, he deeply discourage, return to Germany, where he built himself a house on the brow of a little hill and devoted his life to study and experimentation. After a hush of five years, C.R.C. selected three of the faithful friends of the old convent in which he had been educated , and they began to arrange and classify the great knowlege he possessed. Thus, the Rosicrucian Fraternity was founded. Later four members were accepted. Under the direction of the Father C.R.C. , Head of the Order, they began building a Temple , called "The Temple of the Holy Spirit". When this temple was completed, the Brothers, being now thoroughly instructed in the mysteries and the sciences, agreed to separate. Five of the Brothers traved to distant lands to promulgate their doctrines among the wise of the earth. The travelers were to return to the Temple at the end of each year, or to send an excuse for their absence. The society thus formed was governed by a code of laws. The first rule was that they should take to themselves no other dignity or credit than that they were willing to heal the sick whithout charge. The second was that from that time on forever they should wear no special robe or garment, but should dress according to the custom of the country wherein they dwelt. The third stated that every year upon a certain day they should meet in the "House of the Holy Spirity", or, if unable to do so, should be represented by an epistle. The fourth decreed that each member should search for a worthy person to succeed him at his own demise. The fifth stated that the letters "R.C." should be their seal, mark, and character from that time onward. The sixth specified that the Fraternity should remain unknown to the world for a period of one hundred years. When the first Brother of the Order died, in England, it was decided that the burial places of the members should be secret. Soon afterward Father C.R.C. called the remaining six together, and it is supposed that then he prepared his own symbolic tomb, a perfect miniature reprodution of the universe. The Fama records that none of the Brothers alive at the time of its writing knew when Father C.R.C. died or where he was buried. His body was accidentally discovered 120 years after his death when one of the Brothers decided to make some alterations in the "House of the Holy Spirit". While making his alterations , the Brother discovered a memorial tablet upon which were inscribed the names of the early members of the Order. POST CXX ANNOS PATERO - [ After One Hundred Twenty Years I will appear ]. Waiting for the sunrise of the next morning, they resumed their researches. When they opened the heavy door, they discovered a heptagonal vault. Each of its seven sides , five feet wide by eight feet in height, had well known symbols inscribed on it. The light was received from an artificial sun in the roof, and was almost blinding to the eye. To their amazement , in the middle of the floor there stood, instead of at tomb, at circular altar , on which was an inscription , saying that the apartment had been erected by C.R.C. as a compendium of the universe.Many other inscriptions were seen about the apartment, including. all of which indicated the christian character of the builter. In Each of the seven sides was at door opening into at closet. In these closets they found many rare and valuable articles such the "The History And Life of the Founder"; the vocabulary of the Paracelsus; The Secrets of the Order; together with bells, mirrors, lamps, and various other things.On Removing The altar and the brass palte beneath it , to their surprise, they came upon the body of C.R.C. in at perfect state of preservation. Several theories have been brought forward to sove the riddle of Rosicrucians. The First Theory build up that the Fraternity Rose Cross exist historicamente under the description of his foundation and subsequentes activities insert in its manifesto The Fame Fraternitatis, that appeared in Cassel , German in 1614 with the long title of Allegeme Und General -Reformation der Fame Fraternitatis des Loblichen Orders des Rosencreuzes. Certain discrepancies have been found in this story. It is said that writings by Paracelsus were discovered in the C.R.C. 's vault but if he died with 106 years old and the tomb was sealed at that time and not opened for 120 years, we come upon a historical difficulty because at such time Paracelsus was only one year of age. Curious research relating to the identity of Father C.R.C. is presented by Maurice Magre in his Magicians, Seers And Mystics . He states that Christian Rosenkreutz was the last descendant of the Germelschausen, a german family florished in the 13th century. Their Castle stood in the Thuringian Forest on the Border of Hesse they had embraced Albigense's doctrines, combining pagan superstitions and christian beliefs.The whole family was put to death, by Landgrave Conrad of Thuringia, excepted the youngest son ,who was only five years old. He was carried away secretly by at monk, who was an Albigensian adept from Languedoc. The child was placed in a monastery, that had already come under the influence of the Albigenses, wgere he was educated and made the acquaintance of the four others brothers later to be associated with him in the founding of the Rosicrucian Brotherhood. His account derives from oral tradition . The Second Theory supposed that the Rosicrucian Society has been founded about the year 1610 by a German Lutheran theologian , Johan Valentin Andreae . Some adds that its roots flourished in Middle Ages as a development of Alchemical researshes. According to Robert Macoy,the German Lutheran theologian , Johan Valentin Andreae was its founder , that have been founded as one amplification of an ancient association set along by Henry Cornelius Agrippa. In his Secret Symbols of the Rosicrucians, Dr. Franz Hartmann describes the Fraternity as "A secret society of men possessing superhuman - if not supernatural - powers; they were said to be able to prophesy future events, to penetrate into the deepest mysteries of Nature, to transform Iron, Copper, Lead, or Mercury into Gold, to prepare an Elixir of Life, or universal Panacea, by the use of which they could preserve their youth and manhood; and moreover it was believed that they could command the Elemental Spirits of Nature, and knew the secret of the Philosopher's Stone, a substance which rendered him who possessed it all-powerful, immortal, and supremely wise". He also states that a Rosicrucian is a person who by the process of spiritual awakening has attained a pratical knowledge of the secret of the Rose and the Cross. The Third Theory defends that the Rosacrucianism was the first invasion of Buddhism and Bhramanism in Europe. The Fourth Theory argues that the association of the Rose Cross was founded in Egypt during the philosophical supremacy of the College of Heliopolis in that empire , and that it also perpetuated the Mysteries of the ancient Persia and Chaldea. When we speak of Rosicrucianism as a society of men functioning under the laws and regulations of a physical society , organized under the name Rose Cross, we must then limit ourselves to the opening years of the 17th century, but when we speak of it as a mystical tradition , we can trace it back to Egypt and Atlantis. The Fourth Theory affirms that the ancient Rosicrucian Fraternity was entirely a product of fancy.It is regarded by some scholars that this story of Andrea's was purely romance. Others generally agree with the theory that Andrea, at the time of the appearance of this book, was a young man full of the excitement and ambition, and seeing the defects of the theology and the sciences, sought to purify them, and to accomplish this design imaged a union into one body of all those who, like himself, were the admirers of true virtue.Still others contend that he wrote this account of the rise and progress of Rosicrucianism for the purpose of advancing his own peculiar views of morals and religion. Be this as it may, this so-called "fiction" has persisted through the centuries , and has been readily accepted as truth by multitudes of people. The Sixth Theory defend that the Rosicrucian Society was actually founded about 1604, probably by the English philosopher Francis Bacon, Lord Verulam, well known as the Chanceller of Parnassus, The allegorical Mount of the Poets. It has been proposed that the face of the author of the Chymical Wedding of Christian Rosenkreutz, as preserved on a rare print shown a striking resemblance to that of Sir Francis Bacon , in spite of the age difference. If, as another conjecture maintains, he borrowed the name and identity of William Shakespeare, he could also have assumed , after the latter's mock funeral, the personality of Johan Valentin Andreae. The crescent moon drawn below his bust appers upon the crest of Lord Bacon. In addition, the four letters (OMDC) in the frame at the lower right corner of the plate, by a simple Baconian cipher, can be changed into numbers whose sum gives 33 - the numerical equivalent of the name Bacon. Should this proposal seem far-fetched, its is helpful to know that such practices were common place in Baco's time. The seventh Theory argues that the Order Rose Cross is not merely a secret society but one of the Mystery Schools, although it have been working with some Secret Rosicrucian Socities in diferent periods of History. Writing about the transcendental theory , Manly P. Hall said that "the apparent incongruities of the Rosicrucian controversy has also been accounted for by a purely transcendental explanation. There is evidente that early writers were acquainted with such a supposition - which, however, was popularized only after it had been espoused by Theosophy.(...) This Theory asserts that the Rosicrucians actually possessed all the supernatural powers with they were credited; that they were in reality citizens of the two worlds; that , while they had physical bodies for expression on the material palne , they were also capable, through the sinstructions they received from Brotherhood, of functioning in the mysterious ethereal body not subject to the limitations of time and distance. By means of this "astral form" they were able to function in the invisible realm of Nature, and in this realm, beyond reach of the profane, their Temple was located.(...) According to this Theory , those who have sough to record the events of the importance in connection with the Rosicrucian controversy have invariable failed because they approched their subject from a purely physical or materialistic angle.(...) The mystic believes that the true Rosicrucian Fraternity , consisting of a School of Supermen, is an institution existing not in the visible world but in its spiritual counter part, which he sees fit to call the "inner planes of Nature", that the brothers can be reached only by those who are capable of trancending the limitations of the material world.(...)" Seeing the only wise and merciful God in these latter days hath poured out so richly his mercy and goodness to mankind, where by we do attain more and more to the perfect knowledge of his Son Jesus Christ and Nature, that justly we may boast of the happy time, wherein there is not only discovered unto us the half part of the world, which was heretofore unknown and hidden, but he hath also made manifest unto us many wonderful, and never heretofore seen, works and creatures of Nature, and moreover hath raised men, imbued with great wisdom, who might partly renew and reduce all arts (in this our age spotted and imperfect) to perfection; so that finally man might thereby understand his own nobleness and worth, and why he is called Microcosmus,(1)and how far his knowledge extendeth into Nature. Although the rude world herewith will he but little pleased, but rather smile and scoff thereat; also the pride and covetousness of the learned is so great, it will not suffer them to agree together; but were they united, they might out of all those things which in this our age God doth so richly bestow upon us, collect Librum Naturae, or a perfect method of all arts: but such is their opposition, that they still keep, and are loth to leave the old course, esteeming Porphyry,(2) Aristotle, and Galen, yea and that which bath but a mere show of learning, more than the clear and manifested light and truth; who if they were now living, with much joy would leave their erroneous doctrines. But here is too great weakness for such a great work. And although in theology, physics, and the mathematics, the truth doth oppose itself (3) nevertheless the old enemy by his subtlety and craft doth show himself in hindering every good purpose by his instruments and contentious wavering people. To such an intent of a general reformation, the most godly and highly illuminated father, our brother, C.R. a German, the chief and original of our Fraternity, hath much and long time laboured, who by reason of his poverty (although descended of noble parents) in the fifth year of his age was placed in a cloister, where he had learned indifferently the Greek and Latin tongues, who (upon his earnest desire and request) being yet in his growing years, was associated to a brother, P.A.L. who had determined to go to the Holy Land. Although this brother died in Ciprus,(4) and so never came to Jerusalem, yet our brother C.R. did not return, but shipped himself over, and went to Damasco,(5) minding from thence to go to Jerusalem; but by reason of the feebleness of his body he remained still there, and by his skill in physic he obtained much favour with the Turks. In the meantime he became by chance acquainted with the wise men of Damasco in Arabia, and beheld what great wonders they wrought, and how Nature was discovered unto them; hereby was that high and noble spirit of brother C.R. so stirred up, that Jerusalem was not so much now in his mind as Damasco; also he could not bridle his desires any longer, but made a bargain with the Arabians, that they should carry him for a certain sum of money to Damasco; he was but of the age of sixteen years when he came thither, yet of a strong Dutch constitution. There the wise received him (as he himself witnesseth) not as a stranger, but as one whom they had long expected; they called him by his name, and showed him other secrets out of his cloister, whereat he could not but mightily wonder. He learned there better the Arabian tongue, so that the year following he translated the book M. into good Latin, which he afterwards brought with him. This is the place where he did learn his physicks, and his mathematicks, whereof the world hath just cause to rejoice, if there were more love, and less envy. After three years he returned again with good consent, shipped himself over Sinus Arabicus into Egypt, where he remained not long, but only took better notice there of the plants and creatures. He sailed over the whole Mediterranean sea for to come unto Fez, where the Arabians had directed him. And it is a great shame unto us, that wise men, so far remote the one from the other, should not only be of one opinion, hating all contentious writings, but also be so willing and ready under the seal of secrecy to impart their secrets to others. Now the true and fundamental relation of the finding out of the high illuminated man of God, Fra. C.R.C. is this. After that A. in Gallia Narbonensis was deceased, then succeeded in his place our loving brother N.N. This man after he had repaired unto us to take the solemn oath of fidelity and secrecy, he informed us bona fide, that A. had comforted him in telling him that this Fraternity should ere long not remain so hidden, but should be to all the whole German nation helpful, needful, and commendable; of the which he was not in any wise in his estate ashamed of. The year following, after he had performed his school right and was minded now to travel, being for that purpose sufficiently provided with Fortunatus' purse, he thought (he being a good architect) to alter something of his building and to make it more fit. In such renewing he lighted upon the memorial table which was cast of brass, and containeth all the names of the brethren, with some few other things. This he would transfer in another more fitting vault; for where or when Fra R.C. died, or in what country he was buried, was by our predecessors concealed and unknown to us. In this table stuck a great nail somewhat strong, so that when he was with force drawn out, he took with him an indifferently big stone out of the thin wall, or plastering, of the hidden door, and so, unlooked for, uncovered the door. wherefore we did with by and longing throw down the rest of the wall, and cleared the door) upon which was written in great letters, Post 120 annos patebo,(6) with the year of the Lord under it. Therefore we gave God thanks and let it rest that same night, because we would first overlook our Rotam. But we refer ourselves again to the Confession, for what we here publish is done for the help of those that are worthy, but to the unworthy (God willing) it will he small profit. For like as our door was after so many years wonderfully discovered, also there shall be opened a door to Europe (when the wall is removed) which already doth begin to appear, and with great desire is expected of many. The bottom again is parted in the triangle, but because therein is described the power and the rule of the inferior governors, we leave to manifest the same, for fear of the abuse by the evil and ungodly world. But those that are provided and stored with the heavenly antidote, they do without fear or hurt tread on and bruise the head of the old and evil serpent, which this our age is well fitted for. Every side or wall had a door or chest, wherein there lay divers things, especially all our books, which otherwise we had. Besides the Vocabular of Theoph: Par. Ho. (13) and these which daily unfalsifieth we do participate. Herein also we found his Itinerarium and vitam, whence this relation for the most part is taken. In another chest were looking-glasses of divers virtues, as also in another place were little bells, burning lamps, and chiefly wonderful artificial songs, generally all done to that end, that if it should happen after many hundred years the Order or Fraternity should come to nothing, they might by this only vault be restored again.